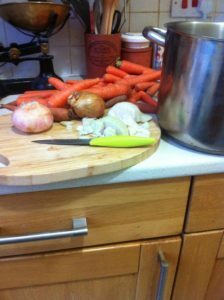 Last year we launched a campaign to encourage and support as many people as possible to make and eat their own vegetable soup. Not just children and families. Anybody. We worked with children at St Mary’s Leith Primary in Edinburgh helping them to explore different flavours and try new foods including some lovely Lentil soup. Whenever we get the chance we shall be popping up at markets, festivals and community events getting everyone in the mood for good food. We would love to connect with fellow soup eaters, lovers, providers and producers, cooks and soup dragons to share recipes, memories, stories and enthusiasm for soup! We want to encourage Soup festivals, Pop up soup stalls, “Souper Tuesday” Soup sharing at work, Soup in the classroom, Soup ambassadors, Zero Waste soup. Soup for all!! If you’d like to get involved do get in touch we’d also love to hear Your soup stories, ideas and suggestions. If you would like Mrs. Mash to come and bring some stories, songs and soup to your nursery, school or other setting just get in touch!